Treat your kids to a larger than life attractions when you enter the Wonka exhibit win a minimum purchase of P100.00 worth of Wonka Products. This entitles you to a Golden Ticket that leads to a magical forest with giant bugs, talking trees and cool magic tricks from a pretty purple witch that eventually leads to the enchanted rainbow. The Wonka Imaginarium is inspired by Roald Dahl’s Charlie and the Chocolate Factory. 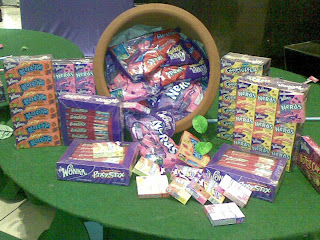 It runs at the Atrium, EDSA Shangri-la Plaza from December 1 to 4 and is made possible by Candy Corner. 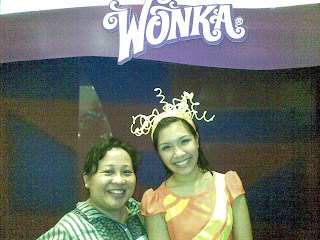 Ricky Andres, President of Candy Corner Philippine informed us that the Wonka Imaginarium is the first of its kind in the Philippines. Candy Corner is holding this actvity in time for the holiday season. “More than just giving everyone a chance to get to know more about Wonka candies, our main goal is to give people of all ages a great avenue to feed their imagination and to find a different, unique activity for the whole family to share this Christmas,” he further added. A candy brand that uses licensed materials from Roald Dahl’s Charlie and the Chocolate Factory and its two movie adaptations, Wonka’s distinct packaging and colorful taste has propelled it to become Candy Corner’s flagship brand. Bring the whole family at the Wonka Imaginarium and be happy with the enchantment!